Got this up and running now. It be useful to share a bit more information over in the 'Computer Audio' topic? That reminds me that I have a Beresford Caiman mk2 DAC. When I first switched it in and on I too said, wow! and Cor blimey and phoned Mr Beresford to tell him. Erm, so impressed was I that after two weeks I was so impressed that I carefully wrapped the Caiman up in its box and forgot I had it! Cheers Phil for reminding me. (I was offered a super fab system with speakers that look like Dyson vac. cleaners that have their own inbuilt DACS etc etc for a very reasonable price and never looked back,so to speak. But this Caiman is a digital pre-amp with a n array of inputs and a headphone socket - remember them!? Today, in conversation with a chum I was reminded that I have some Sennheisers and it has been a very long time since I listened attentively to music this way. So a comparison can be done with the superb svelt Caiman and the SEA but in the meantime I'm putting some headphones on - hurrah and again, cheers Phil. Started building a 15v power supply for when I get Stan to do the "supercap" conversion. Old World Designs chassis with blue acrylic front plate and voltmeter. 18v toroid and Lt1083 regulator module.It's been tested with clip leads and a dummy load. After the SEG has has the supercap mod it is designed to run on 15v DC. I ran my Bushmaster on 13.8v and am using the same PSU on my SEG. I'll get Stan to do the supercap mod on my SEG sometime soon and by then my 15v PSU will be finished. I asked Nick what was the point of supercaps in relation to a linear PSU as I knew he would tell me it's probably not needed but I suppose people have to re-invent the wheel sometimes. Not that we need to alter our design which has been a solid good seller for 9 years now with 1000+ sold. Well, to be fair, just because I cant see what a high value cap would do doesn't mean I am right. Will be interesting to hear Stan's new supply, if it improves things more power to him. 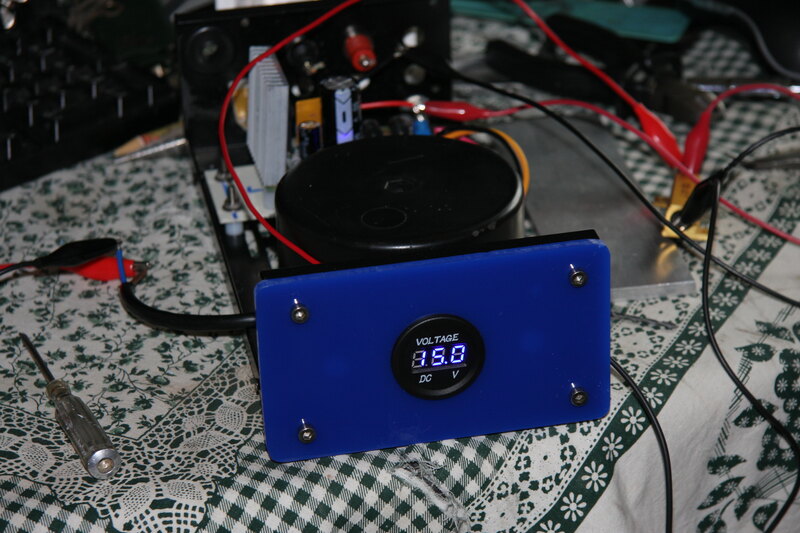 Stan has stated that a standard SEG can be run at 15v, so now the DIY 15v PSU is running my one. Previously I was using a Maplin 12v (13.8v really) PSU, but somehow the new PSU does sound slightly better, there seems more lower level information and perhaps a tad more clarity. When I've got used to how everything now sounds I will try adding some capacitance between PSU and SEG like Stan does with his supercap unit.